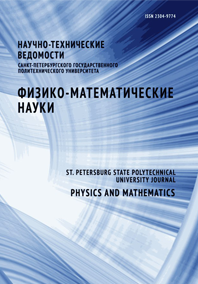 Poludnitsin Anatoliy N. Sharifulin Albert N.
The article is devoted to the study of bifurcations of stationary convection regimes in a closed, heated from below and tilted square cylinder filled with air for cases of heat-insulated and perfectly heat-conducting sidewalls. The temperature and velocity fields were obtained using grid method for inclinations from a horizontal position up to 30 degrees in the range of Rayleigh numbers up to 20-fold excess of its critical value. The limit angle of anomalous-flow existence in the cylinder with the heat-insulated walls was established to be about 3 times greater than that in the cylinder with the heat-conducting ones. In the case of the heatconducting walls the maximum angle of the anomalous-flow existence reached 7.7 degrees at a 3.3-fold excess of the critical value of Rayleigh number.